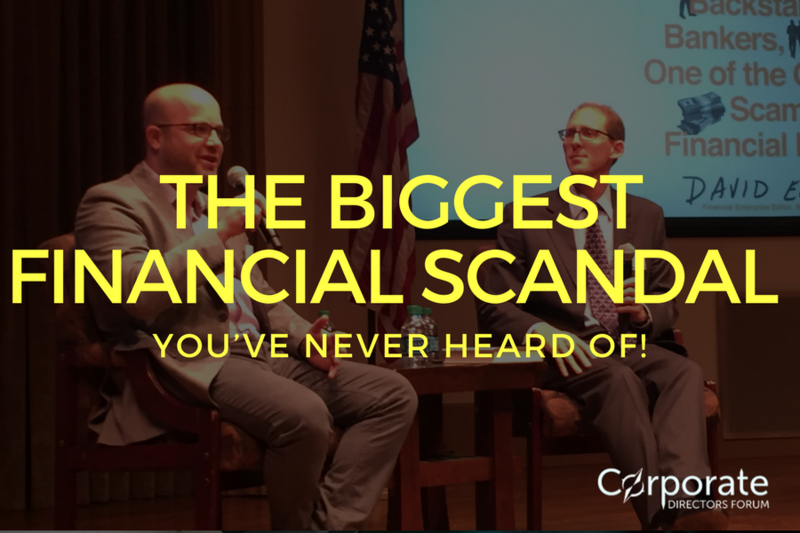 BIGGEST FINANCIAL SCANDAL YOU’VE NEVER HEARD OF! 23 Feb BIGGEST FINANCIAL SCANDAL YOU’VE NEVER HEARD OF! Does your leadership team have the systems and internal processes in place to prevent fraud or discover it before it becomes front page news? Award-winning financial crime reporter, New York Times editor, and author David Enrich held our Corporate Directors Forum audience spellbound in a room of over 200 attendees at our CDF event held in partnership with the USD School of Law. Regaling us with stories from his book The Spider Network: The Wild Story of a Math Genius, a Gang of Backstabbing Bankers, and One of the Greatest Scams in Financial History, Enrich raises a larger question of the culture of dishonesty in powerful financial institutions and the pecking order which tends to throw the little guy under the bus. Tom Hayes, who took the fall, maintains that his criminal activity was condoned and encouraged by his superiors and yet, no one else was convicted. Listening time duration: 17 minutes 22 seconds.